Truesdale Painting, LLC. - House Painters in Phoenix, Chandler, Gilbert and Maricopa. Truesdale Painting of Maricopa, AZ is an experienced painting company servicing the city of Maricopa, Phoenix, and the East Valley communities. Our company offers a wide range of interior and exterior painting services, for both standard residential homes as well as commercial. We approach every project with the highest level of quality craftsmanship. With over 30 years of experience, you can count on Truesdale Painting to deliver top quality services at a price that you can afford. Whether you are looking to have your residence or small commercial property upgraded or just spruced up to sell, we supply all your professional painting and wood finishing needs. As a fully licensed and insured Arizona painting contractor (ROC 296215) we are well known for high quality work and excellent customer service. Excellent Customer Service – We are available 7 days a week for questions and service information. Free Quotes – Free Up Front Pricing, No Hidden Fees. 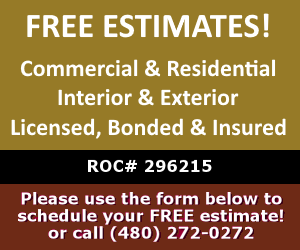 Licensed and Insured – Licensed Contractor ROC 296215 in Arizona. On-Time Appointments – We understand that your time matters. Quality Craftsmanship – From products to technique, we provide the best. © 2019 Truesdale Painting, LLC.